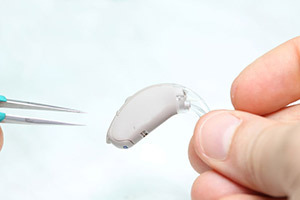 Hearing aids are built to provide many years of useful service. However, since hearing aids are regularly exposed to the harsh environment that is your ears, it means that you may occasionally encounter problems. No matter how thorough you are when it comes to hygiene, the ear canals inevitably attract dirt, moisture and earwax buildup – all of which can wreak havoc with the electronic components in your hearing aids. Regular maintenance can help keep them in great working condition, but once in a while, they may need servicing or repair. Great Lakes Ear Nose & Throat Specialists can help. If you have tried the troubleshooting tips below and still can’t get your hearing aids to work properly, please contact us to schedule a hearing aid service appointment. If your hearing aids are still under warranty and were purchased from Great Lakes Ear Nose & Throat Specialists, repair costs are free. If the warranty has expired, we’ll need to assess the level of damage before providing you with an estimate. Depending on the cost of repairs, you might be better off investing in a new pair of hearing aids. If your current aids are more than five years old, you may want to consider an upgrade – technological advances mean today’s digital devices are more powerful and come packed with features for improved sound quality compared with those that are a few years older. Likewise, if the damage is extensive or your hearing aids have already been repaired in the past, it may not be worth paying more money when you can purchase a brand new pair of hearing aids that should last you another five or more years. The expert staff at Great Lakes Ear Nose & Throat Specialists are happy to evaluate your hearing aids and help you decide whether having them repaired makes the most financial sense. We service all makes and models and are here to provide you with assistance.